With all its current computers equipped with FireWire - and having DV supported in the operating system - you'd think Apple had opened up the market for software companies to write DV editing programs for the Mac. Not so. Apple's marketing of its own software - iMovie (a freebie with all Macs) and Final Cut Pro - has been so aggressive that even Mac-optimised programs such as Adobe Premiere and Media 100's Cinestream are finding themselves to be unwanted party guests, and are now being focused more for use on Windows systems. Now, seemingly, Apple is intent on repeating the trick with DVD authoring. The company's latest flagship system sports a Pioneer DVD-R burner - complete with Apple's budget authoring program iDVD - and we expect lower-priced Macs to follow suit in a very short time. iDVD - a very basic but effective tool - already secures the entry level and must, surely, be offered for sale soon to Mac users who want to add a DVD-R burner to existing G4s. 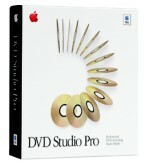 For the higher end, Apple is offering DVD Studio Pro, costing £799. The price may seem steep, but when you consider that the array of features on offer includes multiple angles, alternate soundtracks, subtitles, Macrovision copy-protection and slideshows, the cost starts to seem quite generous by current market standards. The high-level features-set and mid-range price will doubtless serve as a deterrent to any other software developers keen to address the Mac user. Assuming, that is, DVD Studio Pro actually delivers. DVD SP's list of features would logically suggest that it's a must-buy product, but our first impressions were far from glowing. The interface itself is centred almost entirely on text-based drop-down lists, many of which use quite ambiguous terminology. As the program had been pre-installed on the 733 system, we had to ask for a manual, and wait the best part of a week for it to arrive. The manual, and the program's help files, weren't that much help either, and we ended up calling on the folks at Apple to give us a run through of the interface and put our brains in the right gear to look at the program fairly. That meeting was spent in a coffee bar in Piccadilly, going through the program at a little table with a Titanium PowerBook and a tiny LaCie 30GByte FireWire hard drive. All was well, until the police cleared us out, suspecting a nearby parked van to be a cunningly-disguised bomb. We concluded the session on DVD authoring, sitting on the pavement of Shaftesbury Avenue, just opposite a Chinese take-away. While this information has little to do with the review, we thought it painted a pretty picture, and nicely illustrates just how very far video technology has come. Lesson over, we set about constructing our own project back at base. The first thing to understand with DVD SP is that it doesn't give the user any real opportunity to play. While those used to graphics and video editing programs can readily take an approach of build-it-as-it-goes, DVD SP expects you to be very clear on exactly what this disc will be, and have all the media - video, audio, menus and graphics - prepared in advance. And, for the preparation, it becomes clear that a copy of Final Cut Pro is pretty much essential, as is Adobe Photoshop - although we found that the recently released low-cost Adobe Photoshop Elements will probably do everything required on the graphics front at a fifth of the price of its big brother. There's no doubt that DVD Studio Pro offers a lot of features for the money. And, if other players in the software market feel able to compete in the same price-range, it could be the start of something very good for video makers using the Mac platform. We make no excuses, however, for the fact that we greatly dislike the program's interface. We'd much prefer something graphic and more tactile. Once the basics are understood, however, it's not difficult to make good progress and, eventually, good discs. But there's a lot to watch out for, and the dependence on the text-heavy Property Inspector makes it far too easy to make mistakes or miss important settings. We have no doubt that - if competition picks up - DVD Studio Pro will be refined and updated, and could well turn into something quite special. But for the moment, there's really no competition. And that means no choice. For the full review, see the August 2001 issue of Computer Video.